Pulsating Sprinkler adjustablecircle 1"IRO-166 with 2 brass nozzles. 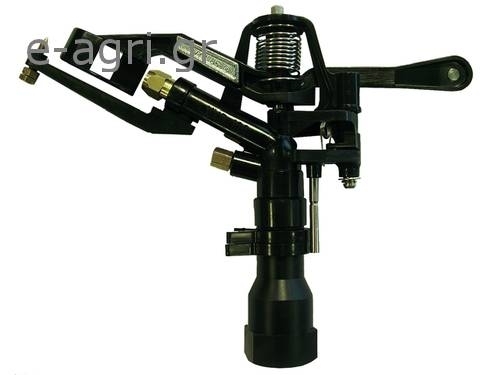 • agricultural impact Sprinkler medium-high flow. • female connection 1 ". • the nozzle angles of 28 ° and 14 °. • mechanical system using very easy and omegasquick to adjust. • Used in irrigation coverage with medium-high forcover coverage frames the sides and corners. • Great mechanical and hydraulic design provides afor energy saving and optimal coefficientcoverage in your distribution. • Range: 16 to 24 m.
• Flow: 2240 to 7.840 l / h.
• Working pressure: 3,5 - 6 bar. • Nozzle: A long-range master and a secondaryshort-range deflection. • Trajectory angles: 28 ° and 14 °. • Maximum stream height: 3 m.
• Rotation time: Depending on the pressure and the nozzlesconstant and continuous. • Uniformity coefficient higher than 90% in frames24x24R, 25x25t, 25x26t. • Horticultural plantations, cereals, tubers,legumes, and fruit.